This is Cherokee, she has been a familiar face lately at Mackay Veterinary Hospital. In december 2014, Cherokee ruptured her cruciate ligament - which is a ligament in the knee that helps to stabilise the joint. Cherokee then had surgery on her knee to replace the ligament. Unfortunately her knee injury didnt respond as well as we would have liked after her surgery so Dr Bill decided she would benefit from a more involved procedure. He used a new technique utilising a human surgical grade titanium foam wedge to alter the biomechanics of her knee joint. During her rehabilitation Cherokee had to stay quiet and confined for 4 weeks (which she wasnt impressed about), but the effort was worth it as she was then able to use the leg wihtout any problems at all. Just at the time when Cherokee's knee was finally 100%, and she could go back to being her excited, active happy self, we found a nasty lump on her front leg, which needed to be removed. Unfortunately due to its location, it left Cherokee with a large wound on her leg, which needed to be bandaged for two months and required confinemnet and rest! Cherokee was so keen to get going that she started chewing at her bandage, and ended up having to wear the "cone of shame", which as you can see she was not very impressed with! Cherokee's leg healed incredibly well, and at long last Cherokee was recently able to get out of the house and go for a run at the beach and be a normal dog! This is Pedro. 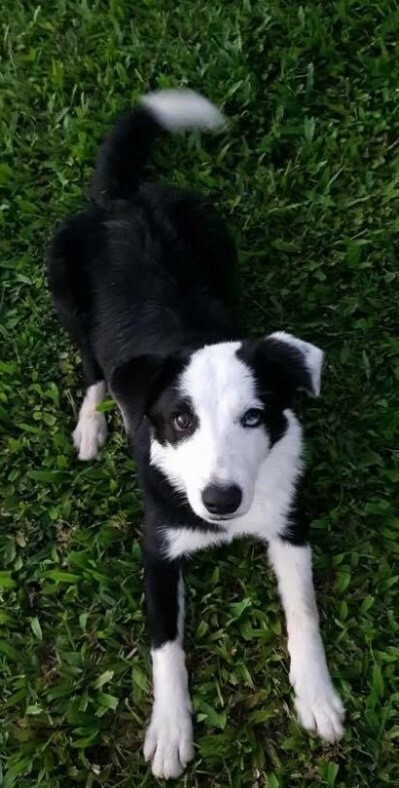 Pedro is a six month old border collie who loves to run around and play ball. Unfortunately for him, he was hit by a car. This caused one of his bones to protrude through the skin of his back leg. 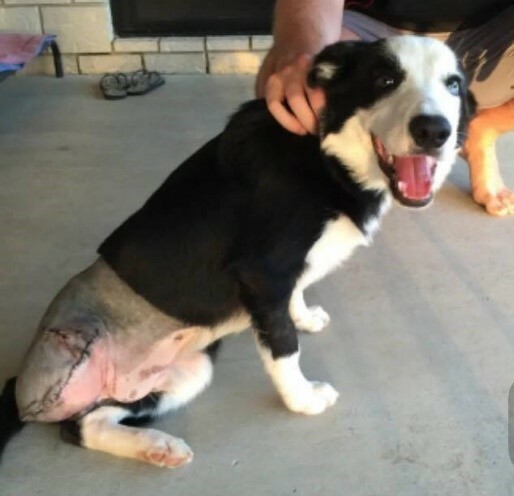 Even with this injury Pedro was still a happy, bright puppy. Unfortunately we had to amputate his injured leg for him to get well again. His surgery went terrifically and he is now back to chasing his ball and is as happy as ever. Just minus one leg. 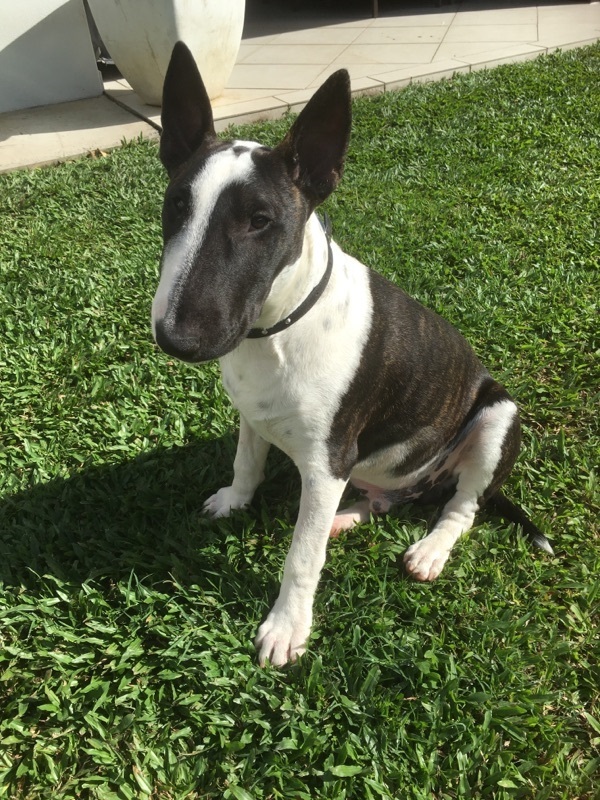 Meet Austin, a 6 month old Bull Terrier who was happily chewing on an uncooked brisket bone at home when he suddenly started vomiting. He was brought in to the clinic where an xray was done revealing a piece of bone stuck in his oesophagus between his heart and his stomach. Austin was given some time overnight to see if the piece of bone would move down into his stomach but unfortunately it did not, so he had surgery to remove the piece of bone which was done successfully. He recovered well over the next few days in hospital slowly able to eat and drink again, then was finally able to go home. Austin went home at about midday only to return three hours later with a fish hook stuck in his lip! 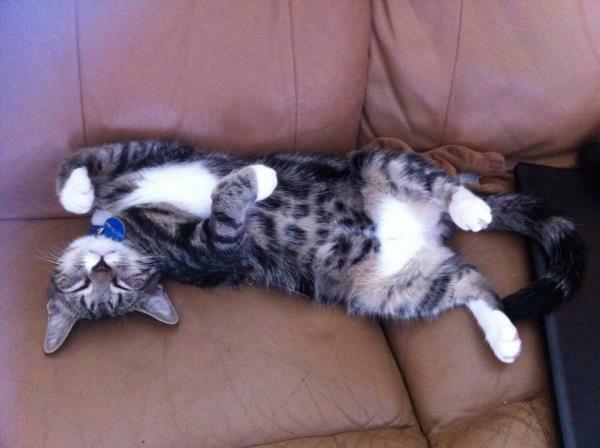 He managed to get into a bag at home – luckily he was unable to swallow it! The hook was removed and he later returned home to his family where he has made a full recovery. Let’s hope he manages to stay out of mischief for a while! Meet Rocket! At not even one year old this cuddly little man came into our Mackay Veterinary Hospital because he was having trouble urinating. After our Vets performed a thorough examination and ran some tests it became evident that little Rocket had a blockage in his bladder. Unfortunately for male cats, this particular blockage is a common problem. Rocket had to undergo an anaesthetic in order for us to remove the blockage as safely and as pain free as we possibly could for him. Luckily for Rocket, once he had recovered and his urination returned to normal, he was able to return home to his loving family. It was such a pleasure having such a smoochy kitty stay with us in hospital. 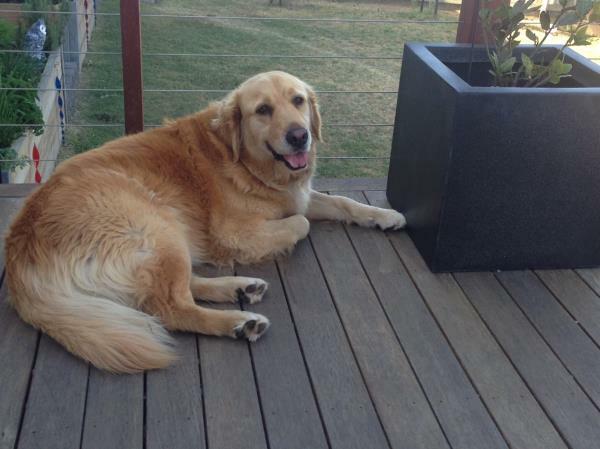 Macy is a 3 year old golden Retriever who one morning attacked a brown snake that came into her yard at home. Her owner found her and the snake and brought her into the clinic straight away. She was brought in collapsed and unable to walk. She had a clotting test on her blood performed which showed that her blood did not clot in the normal time, which confirms that she was bitten by the snake. she was treated with snake antivenom immediately. She developed some tongue swelling and was monitored very closely during this time - it is thought that she may have been bitten on or around the tongue by the snake. she remained stable and recovered beautifully. ‘Harry Winston’ is a 9 year old male dog who was going for his afternoon walk when he was attacked by another dog. He was brought into the surgery immediately and was unable to walk and in shock. He had several puncture wounds and it was evident that there was spinal damage present resulting in him being unable to use his hindlegs. 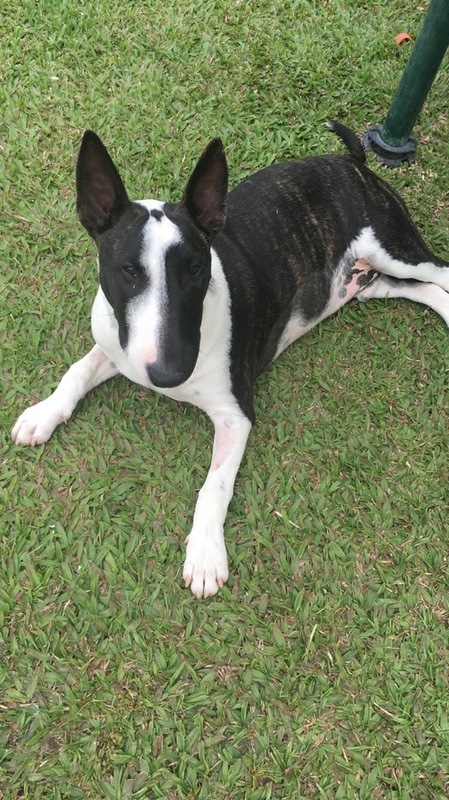 He remained in hospital for 2 weeks with strict rest and daily exams to monitor if there were any changes in neurological function in his hindlegs. During the 2 weeks in hospital he showed little to no improvement and it was unclear whether he would ever regain function back. He was sent home for further rest at home. He was brought back in for a recheck a week later with having showed an improvement – he could walk although he was still somewhat uncoordinated and neurological exam showing that there were still deficits present. A month later he is now able to walk well, can run and can go up the stairs at home. He is still unable to jump however he is back to his happy self and can enjoy going for walks again. 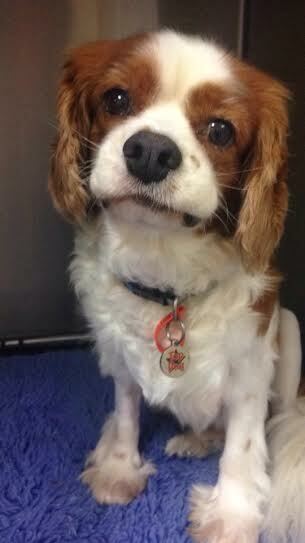 Meet Rusty, a much loved 6 year old male Cavalier King Charles Spaniel . Rusty came into the hospital early one morning in May with a sore hind leg. We determined that the problem was associated with Rusty's hip and radiographs soon revealed that his hip was dislocated. Rusty was diagnosed with hip displaysia, a disorder that involves the abnormal development of the hip joints. This led to him continually dislocating his hip, an unusual occurrence in the absence of any real trauma such as being hit by a car. There were several options for Rusty's family to manage his problem. Unfortunately due to the abnormal development of his hip joints, relocating and stabilising his hip was unsuccessful. The best option for Rusty was to have a total hip replacement procedure, where both the ball and socket are replaced by implants, similar to the same procedure in people. This would enable him to maintain his mobility, especially as his other hip wasn't 100% either. After much planning, a referral to the orthopaedic team under the direction of Dr Jason Mouatt at VSS in Brisbane was organised. A special sized implant was ordered and sent from the US. 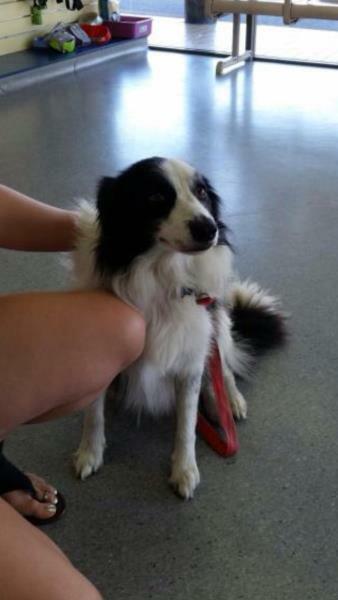 Rusty travelled to Brisbane in the excellent care from Kris from Homebush Kennels in late May. 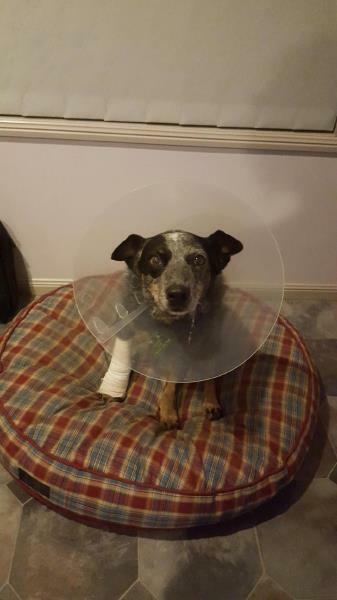 His surgery was a great success and he spent a further 2 weeks in Brisbane for his specialised post-surgical care after which he travelled back to Mackay and spent another week in Mackay Veterinary Hospital being spoilt by the nursing team. At present he is on a strict exercise and physiotherapy plan in the loving care of his family and will soon have his 6 week post-operative radiographs, which hopefully will give him the green light to allow him to continue his happy comfortable life. 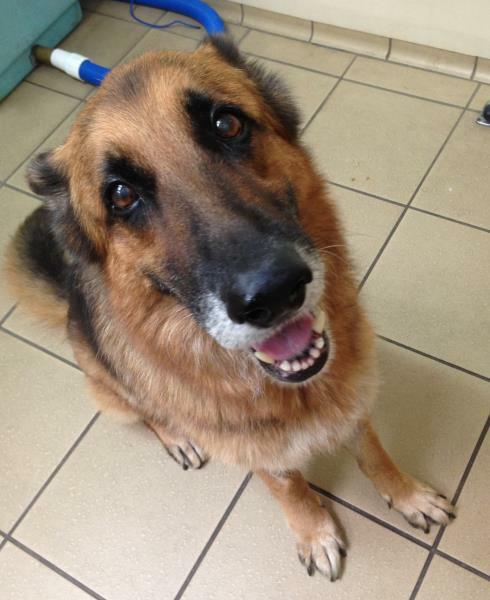 This gorgeous girl is 'Zeta', a 10 year old German Shepherd who recently found herself in a spot of bother early one morning. Her owners woke up to find her vomiting and her abdomen bloated, even though she had been perfectly healthy the night before. 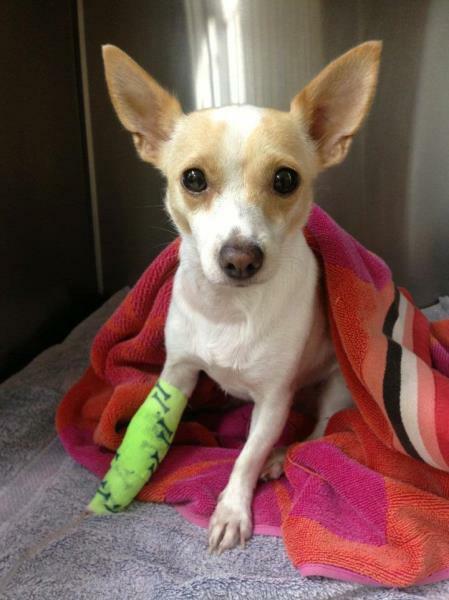 She was rushed into Mackay Veterinary Hospital where the vet performed an X-ray of her abdomen. Unfortunately for Zeta, the X-ray revealed that her stomach had twisted. This condition is called Gastric Dilation and Volvulus (GDV), often known as 'bloat', in which the dog's stomach rotates and fills with gas, causing compression of other abdominal organs and blood vessels. It is an extremely dangerous and often fatal condition that requires emergency surgery. Firstly, a tube was passed into Zeta's stomach to relieve some of the gas accumulation. Surgery was then performed to correct the torsion and suture the stomach to the abdominal wall to prevent it from twisting again in the future. After surgery, Zeta had to be monitored very closely due to the risk of severe post-operative complications, including developing blood clotting disorders or heart arrhythmias. There are several factors that increase the risk of GDV developing. Large breed, deep chested dogs are most susceptible, including Great Danes, Irish Wolfhounds, Dobermans, Mastiffs and German Shepherds. However, any breed of dog can develop GDV. Other risk factors include exercising after being fed, feeding only once daily, eating rapidly, any stressful event within the last 12 hours, or dogs with stressful personalities. However, sometimes a causative factor cannot be identified. Zeta is a prime example that the most important prognostic factor as to whether a dog survives GDV or not, is early intervention. Post-surgery, Zeta improved in leaps and bounds and soon returned home to her relieved family. All dog owners, particularly those who own high-risk breeds, should be mindful of the signs including vomiting, non-productive wretching, abdominal enlargement and pain. If any of these signs are noticed, a vet should be contacted immediately. Meet Ellie, surely the sweetest fox terrier in mackay! The owners of this little girl phoned our after hours number one evening very concerned that Ellie was acting out of sorts. While she had been perfectly fine just a few minutes earlier..., after letting her out into the yard she soon began vomiting & frothing at the mouth. Her owners initially believed that Ellie had been licking a toad and brought her in for examination. When Ellie arrived at the clinic she was observed to be in severe cardiovascular shock, and the vet became suspicious of a snake envemonation even though the owners have never seen a snake in their yard. A blood test showed that Ellie's blood was unable to clot, confirming the diagnosis of a snake bite. Snake bites are extremely dangerous and have the potential to be lethal in all animals, therefore Ellie's prognosis was guarded. Ellie received intravenous snake antivenom and was hospitalised for several days. During her time at Mackay Veterinary Hopsital, Ellie was the perfect patient and recovered in leaps & bounds! After a few days she was able to go home to her family, and will hopefully leave snakes alone in the future. All the vets and nurses are so pleased Ellie is feeling better! Ellie was very fortunate that her owners intervened soon after the onset of symptoms so medical treatment could be administered quickly. Early intervention is crucial, and many animals are not so lucky. We are seeing more snake bites recently, so if your animal begins to show any signs of envemonation including sudden collapse, vomiting, frothing or Wobbliness, please contact the clinic immediately. Meet Bella, now a very happy and energetic 2 year old border collie. We first met Bella when she was a 4 month old puppy. Unfortunately she was a very sick puppy. When she came to us, Bella was suffering from the Parvo virus, a very nasty disease that causes vomiting, bloody diarrhoea and dehydration. If left untreated Parvo can cause death. There is no antidote for the condition - we treat the symptoms as they are presented. Bella was placed on intravenous fluids, antibiotics and blood transfusions. She was put in isolation as Parvo is a highly contagious disease. Bella spent ten days with us receiving treatment and was then sent home to continue her recuperation. She was soon back to her usual self, a healthy, happy and playful puppy. Bella returns to us once yearly to receive her health checks and updates her parvo vaccination to help prevent this from happening again.